for its students to register in the competition. * Male and Female competitors do not compete in the same divisions. ** All athlete’s will compete in the same weight/age brackets regardless of belt color. OPEN CLASS Athletes who placed 1st, 2nd or 3rd are eligible to register for the Open Class bracket. Black Belt Adult – All athletes are eligible to compete in open class. The athletes who are willing to register for the open class may do so at the event’s open class registration table. Athletes must register in Open Class within 15 minutes after receiving their medal awards. There will be a registration deadline for the black belt adult division, which will be posted alongside the event’s schedule. Athletes will not be able to register for the open class division after its registration deadline. IMPORTANT INFO• Matches may start 30 minutes in advance. Athletes should be in the warm up area at least 40 minutes prior to the time assigned for his or her division on the schedule. 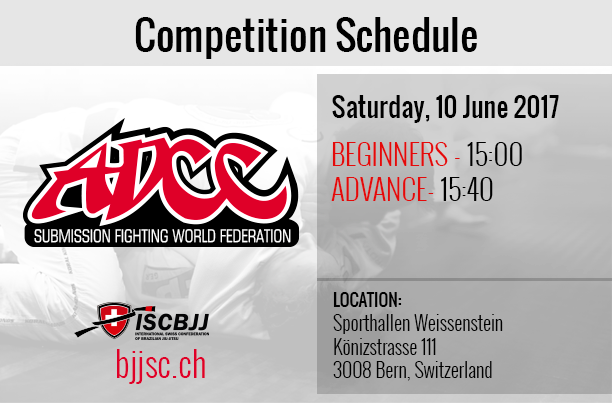 Exemption: Athletes who are alone in their bracket are eligible to receive a full refund of the registration fee if they contact info@bjjsc.ch and request to withdraw their name from the competition prior to the end of the appointed event registration check day. • Athletes will receive a complimentary event t-shirt which they should pick up at the event. All shirts should be picked up at the event’s shirt booth. • There will be only one group trophy for this event. • Any false information provided during registration such as, but not limited to, DOB, may lead to immediate disqualification. Such actions are subject to suspension or even banishment from future BJJSC events. • If you are alone on your bracket you can contact info@bjjsc.ch i till the day before registration check day and request a change on your registration. 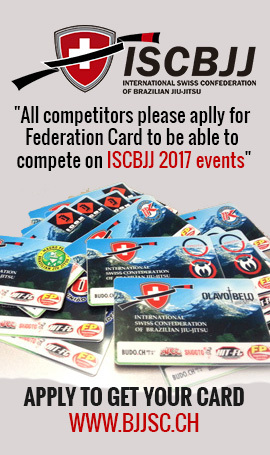 BJJSC does not guarantee that the division you want to be moved to will have another competitor at the day of the event.